Ok, this is probably the cheapest visualization I ever created, but since Ben Fry has done the same before, I think I’m allowed to do so, too. 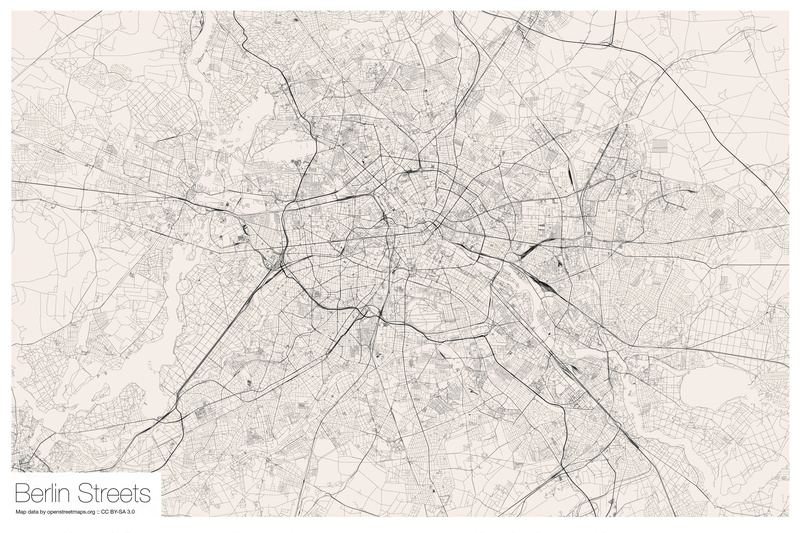 This map simply shows all streets and railroads of Berlin. Likewise as in the US version, one can identify relevant geographic features like parks, rivers and lakes at places without streets. Thanks to the kind folks at OpenStreetMaps and cloudmade.com, creating this image took me five minutes, literally. Three minutes for downloading the Illustrator document and two for a little editing. Well, I not even dare to put my name on the map… Ok, this is probably the cheapest visualization I ever created, but since Ben Fry has done the same before, I think I’m allowed to do so, too. 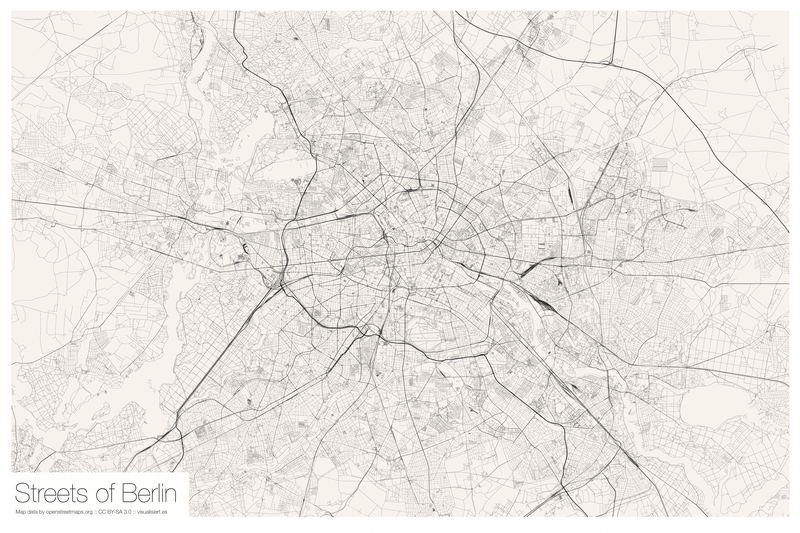 This map simply shows all streets and railroads of Berlin. Likewise as in the US version, one can identify relevant geographic features like parks, rivers and lakes at places without streets. Thanks to the kind folks at OpenStreetMaps and cloudmade.com, creating this image took me five minutes, literally. Three minutes for downloading the Illustrator document and two for a little editing. Well, I not even dare to put my name on the map… Creating the same map for Germany would be a little harder due to the increased amount of data. But to really keep up with the US version by Ben Fry the ultimate goal should be to render a street-only map of entire Europe. Kind of a challenge, isn’t it? And, just in case you want to hang this map upon your wall (like me), here are 150dpi (11mb) and 300dpi (27mb) versions which you can use to print the poster at your favourite poster printing service. Creating the same map for Germany would be a little harder due to the increased amount of data. But to really keep up with the US version by Ben Fry the ultimate goal should be to render a street-only map of entire Europe. Kind of a challenge, isn’t it? And, just in case you want to hang this map upon your wall (like me), here are 150dpi (11mb) and 300dpi (27mb) versions which you can use to print the poster at your favourite poster printing service. Update: here’s another map for Hamburg. Update: I printed the map on poster size. Also I wrote a German article about this project on visualisiert. Do you mind giving us the steps that allowed you to create this in 5 min? Or is there too much magic that you can’t share? No problem, at first I downloaded the berlin.ai.zip, unzipped it and opened it in Illustrator. The document contains several named layers like “railway” or “motorway” from which I hid the ones I don’t want to appear in the map, like the “other” layer that contained building outlines. Next step was to set up the page layout (50x75cm in my case) and scale and move the map layers to get a nice view on Berlin. The last thing to do was to create a white border around it and to add the label. File > Export > JPEG > 300dpi did the rest. Hope this helps. Note that this simple procedure is only possible for small regions like the city-states in Germany. Doing the same for larger areas is not possible since the AI document would be too large to open it in Illustrator, like 11.1GB for just one of the German states. I tried to download the 300dpi version of the Berlin map, but the link seems not to exist anymore. Could you please put it online again? Hi Jim. I used posterXXL, the large sized poster on matt photo paper, I guess. Nothing special, I think. Quality was okay, but I assume there are better ways for printing vector maps. These are beautiful - because of their simplicity. Could you speak on the printing service you used, and what materials they printed on? Thanks for the link to the 300dpi file, Gregor! Now, I can print it. I wrote some scripts (it tooks more than 3 minutes) and plottet all streets of Germany into one plot. In that case I had to handle with about 18.7 millionen road segments. As data source I used the open street map data extracts from Geofabrik.